Become the ultimate dens expert in the Animal Jam universe. Find in-game information, fun facts, tips and tricks from Animal Jam gamers, plus behind-the-scenes info you can't get anywhere else! 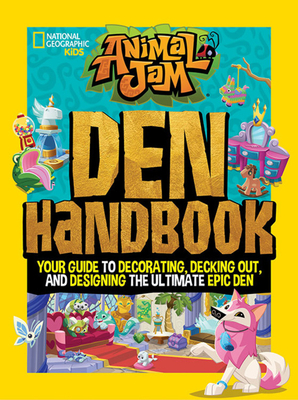 Get the inside scoop on how to design and decorate the perfect den, tips from Animal Jam players and pros, plus how to earn the best stuff to deck out your space. Layered with fascinating information and fun facts, gamers and animal lovers alike can also learn about amazing real-world animal homes. Perfect for gaming experts and newbies. TRACEY WEST is the author of more than 200 books for children and young adults, including Pokemon chapter books and the popular Pixie Tricks series. A seasoned game-guide writer, West wrote the guide to Temple Run for Nat Geo Kids, many Disney Club Penguin handbooks, and the definitive guide to the kids online virtual world Poptropica. ANIMAL JAM, now inhabited by more than 140 million animals created by players, is the largest online social network for kids in North America. From its Salt Lake City headquarters and studio office in Amsterdam, the WildWorks team is expanding the world of Jamaa to encompass mobile devices, consumer products, books, and animation. Animal Jam is produced in partnership with WildWorks and National Geographic Kids.